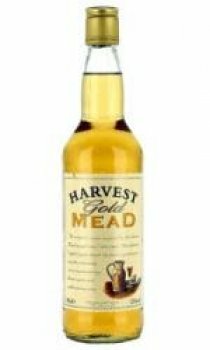 Harvest Gold Mead is the classic interpretaion of traditional mead, the storied drink of ages. Existing 10,000 years ago, mead is very likely the oldest known alchoholic beverage. Indeed the pages of time are replete with reference to it. This delicous English tipple blends the finest ingredients to provide a delicately sweet mouthwatering flavour and rich golden honey colour. Produced by flavouring fortified British wine with natural honey flavour. When heated, this wine makes the perfect winter drink better than any mulled wine I've had. And when chilled, makes a referencing summer drink. Definitely worth piking up a few bottles as it's very moreish. Would I buy it again? YES. I was curious about mead and how it tasted like, and decided to buy this bottle via this website (as here in Spain sadly is impossible to find), and it tasted the way I imagined, or even better. It's currently (although I've yet to taste spiced mead and wine) my favourite drink. Found this sort of 'by mistake' and thought, aye, what the hells, try it. It's sweet as you would expect, similar in many ways to a Moscatel but not as cloying on the palate, it also has that delicious honey flavour right through from start to finish which (for me anyway) makes me want more. Lots more. I've tried Lindisfarne Mead and think that not as pleasant as this one, I realise this is probably a mass-produced drink in huge stainless steel vats but for me, yeah, it works well enough. A lot about a drink is the way you serve and present it (don't you hate those plastic glasses at outdoor events?) and this is no different; the first time was in a small stone hut in the middle of the Pennines and it was room temperature and straight from the bottle (well it's a sort of glass...) and it was good enough, however it is vastly improved by a light chilling and serving in a good sized goblet, you can get the aroma, the flavour and most of all the volume that (let's face it) we're all after. Sticking it in the freezer for an hour to chill it right down and then serving in your favourite pewter or horn goblet and pretending to be a viking works well too, you get the cold liquid and then, as your mouth and throat warm it, the aromas and flavours are intensified Would I buy it again? YES.